Marketing and selling in the B2B space presents some enormous challenges. In an industry where everyone seems to know everyone, it can be difficult to know the best way to approach some of the more traditional aspects of marketing. Content marketing is no exception to that. But instead of forgoing your content in favor of more traditional methods, I recommend taking a deeper look at what you can do to stand out. B2B marketing content might be different in application to other material, but you can still use it as a powerful lead generation and nurturing tool. So I want to dive into some of the best advice for creating and sharing B2B content. You’ll find actionable tips that can open doors to new business in the years ahead. But first, let’s set a bit more context for why B2B content is unique. 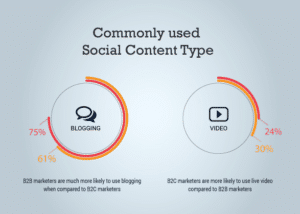 What makes B2B content so different? Creating a blog, video, or social post that resonates with a B2B audience is fundamentally different in a lot of ways. 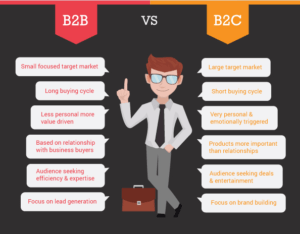 To see what I mean, examine this comparison between B2B and B2C content. A lot of elements stand out here. You have a smaller market, an audience that demands expertise, and a longer buying cycle. B2C businesses may take a few minutes, or days at the most to have a customer complete a sales cycle. But when you’re dealing with multiple stores, tons of equipment, and lengthy contracts, your customer isn’t going to rush into a purchase. They’re going to take their time and evaluate every element of your business. That means you have to find a way to create content that stands out and provides significant value. 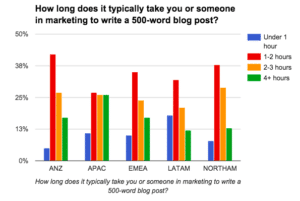 B2B businesses are going to spend more of their time and attention on Blogging. On the other hand, B2C content creators are going to spend significantly more time on video. So not only is the focus different but the types of content that are typically used vary from the B2C market. But perhaps most importantly, it’s worth noting that B2B marketing content is still relatively underutilized. 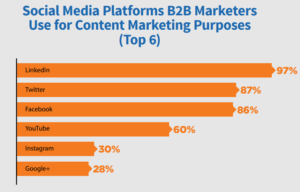 According to research conducted by the Content Marketing Institute, only 28% of B2B businesses feel that their content marketing efforts are sophisticated or mature. That means there’s a lot of room for growth when it comes to generating powerful and compelling content. And it also means that a lot of businesses need to start looking into creating content that serves their audience. So to help you find a way to start creating top-notch content, I want to share the top four tips that help content succeed in the B2B space. First and foremost, you have to be aware that good content is going to take time. 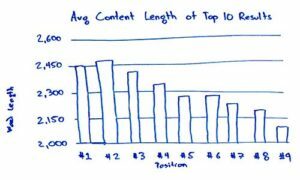 When you look at the average length on a top-performing blog post, you start to notice a pattern. They’re all really long. At least 2,000 words, and usually much more. That means that these blog posts aren’t a simple five-minute read. It also means that it’s going to take you a lot more time to create a blog of that length. In 2015, Hubspot shared that numerous companies were spending four or more hours writing only 500 words. That includes research, writing, and editing, but it’s still a long time to spend on just one post. And that was just 2015. There’s a good chance that as time goes on, blog posts will start getting even longer as more businesses catch on. 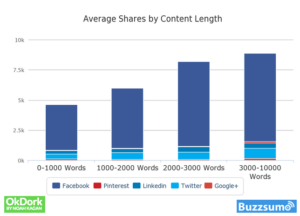 So why does creating a longer piece of content seem to work better for B2B? Part of the answer has to do with the way business owners search for solutions on the web. 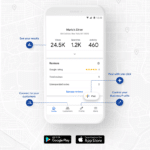 While B2C businesses can typically rank for single keywords on a search engine, companies tend to use longtail search phrases when they’re looking for a business-oriented solution. 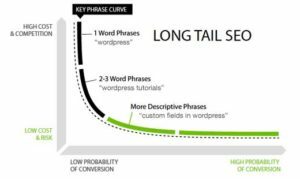 These words and phrases usually have less competition and lower probabilities of conversions, but also tend to pay off more in the long run. They’re easier to build authority for, which means you can rank for them much quicker as well. What’s more, these posts also tend to get shared more often, which means you get better results for the time you do put in. If that seems like a lot to consider, it’s because it is. Committing to creating more extended content will require more of your resources, but it will also provide better results in the long run. You’ll get more traffic, more shares, and more money in the long run by creating longer content. As a B2B company, you may find this point a little strange. 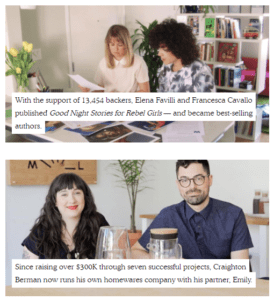 But when you consider the massive success of online brands like Kickstarter, you start to see the validity of focusing on a story with your content. From the very beginning, Kickstarter is drawing its audience toward the idea of a story. And who is their audience? Potential business owners. You probably don’t think of Kickstarter as a B2B business, but that’s primarily because of how effectively they’ve branded themselves. They make money when the stories they share also make money, which is why their entire business model is designed to be one big story. So when you think about it, their story is that they help business owners tell their story. And they show it off as much as they can. Their website is littered with the success stories of businesses and entrepreneurs who have used Kickstarter with significant effect. By focusing on telling these stories, they don’t even need to sell their platform. They make you want the platform before money ever enters the picture. That’s evidence that B2B marketing content can be compelling when presented as a story. Focusing on the conflict, climax, and resolution of your audience before you talk price can make them more eager to come to the table. 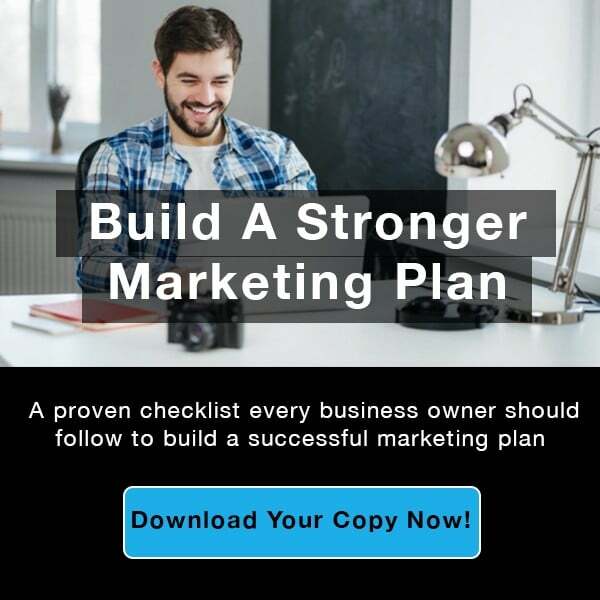 It’s a simple method, but a powerful way to create high-converting content that will serve your business for years to come. When it comes to B2B marketing content, blog posts are typically the first thing that comes to mind. And that’s not without reason. It’s been proven through the years that simply creating and sharing blog posts can help improve your overall digital performance. 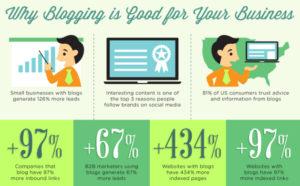 B2B companies with blogs see more leads and more social media followers. Plus, they have better performance on search engines as a whole. But it’s very easy when you’re talking about content to focus on a few select types that seem to perform well. But that may not be the best idea. Blogs are great, but it also pays to create a strategy that incorporates numerous different types of content. 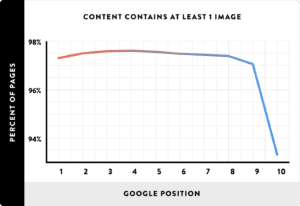 For example, one study has shown that incorporating imagery in your content helps you rank in the top 10 on Google much more consistently. You may have noticed already that I’ve been sharing images throughout this post, and this graph is why. If you’re able to create, find, and share images in your content, you’re much more likely to see organic traffic from interested parties. And those visitors are going to be much better leads in the long run. Another way you could vary your content format is to utilize video, which again has been proven to help engagement. 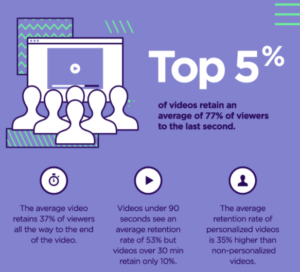 Video holds the attention and keeps your audience interested in your brand for a longer period. If you put the same content on a blog and in a video, you’re more likely to see success from the video. My point here is that creating layers to your content helps you build a more omnipresent brand. The more content types you create, the more likely it is your content will succeed in the long run. So if you can address the concerns of your audience at every turn across multiple platforms, you can win more leads and close more sales. But if you only focus on creating the content that you think will perform well, you’re not going to get very far. Try brainstorming and creating different types of content to see what works. With time, your brand will grow and you’ll be able to cater your approach to the exact needs of your audience. It might be tempting to only create or post your content now and then. 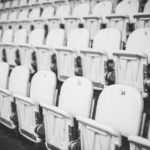 After all, your audience will come and find the content you do create. Why risk creating too much? But that mentality runs against what the data shows. The only practical way to use your content in the B2B space is to create and share regularly. The statistics in the image above were compiled by LinkedIn, and show a few significant points. First of all, it takes an average of 10 pieces of content before they decide to make a purchase. If you only create one piece of content per month, that’s theoretically creating a sales funnel that spans a ten month period. That also assumes that your potential buyer isn’t going to go somewhere else in that period. And that brings up the second point – where should you be sharing the content you do create? Once again, LinkedIn points to an answer: themselves. 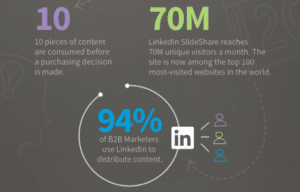 A staggering 80% of B2B leads come from sharing content on LinkedIn. That means that more than any other site, you should focus on publishing and sharing your content on LinkedIn. And if you doubt that, plenty of other studies have verified that LinkedIn is one of the top sites for B2B marketing content. 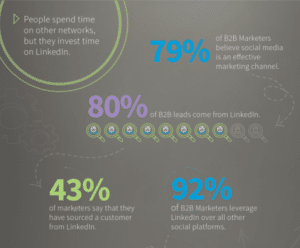 By far, the majority of B2B businesses are turning to LinkedIn. But if you went by sheer popularity, Facebook or Twitter would likely be your first choice. And if you went with your gut, you’d be afraid of oversharing. 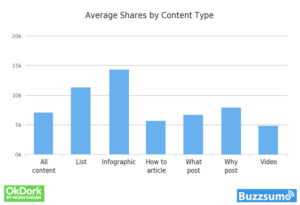 Instead, you should be regularly sharing content on a proven source of B2B leads. You’ll see a better return on your content, and you’ll be more likely to succeed in the years to come. B2B content might be nuanced, but it’s worth investing in. You can create a robust sales funnel that meets and exceeds the needs of your audience like never before. Commit to spending time on your content, and use it to tell a story that your audience engages with. Try out multiple formats and stick with what works. And finally, share your content authentically on proven platforms. If you take steps now to start creating useful B2B marketing content, you’ll begin to see doors opening up in the coming years.